While I'm in Alaska, over all of my care giving trips, broken wrists, or visits to help others, I always fit in one 'fun' day amidst all of the challenging times. And whenever, my Alaskan sister-in-law visits me here in Oregon...we do the same! 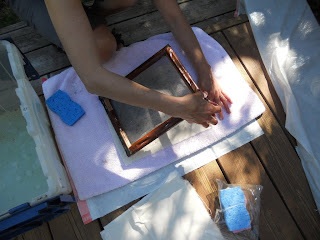 And one of the 'funnest' of most fun days was when I first made paper with my Douglas Island Sister-in-law. We went on to make it inside my parent's house in their kitchen, in her kitchen, in her yard while it wasn't raining, and down in Oregon in my own yard in between building twig furniture and other wildcrafts. So, when family came to visit over Easter weekend, I couldn't wait to do a little bit..OK, a lot ;)...of the same! 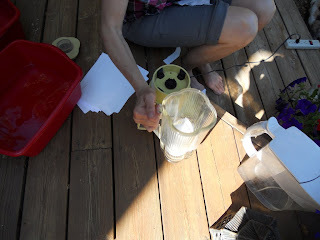 The weather was fabulous, and it was the perfect time to do some wildcrafting, once again! Collecting moss and lichen, flower buds and tiny little leaves, bits and piece of fun that all come from nature's bounty....and creating lovely and fun things from that bounty. 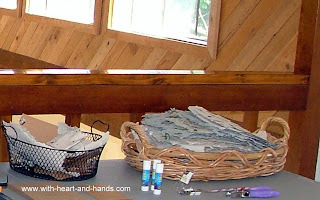 So, I am sharing my love of wildcrafting and paper arts with the home craft of paper making with all of you, as well! My photos are taken from a multitude of locations, states, weather and paper crafting conditions! People who wait for 'just the right time' to create art will never find 'just the right moment! 'You just do in even on the spur of the moment with makeshift equipment and it is the most fun..whatever we make, whatever we do! I've made paper on 8 different occasions now. Each time was different, in a completely different space and each time, time-space-creation was a wonderful experience. 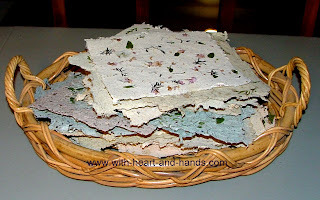 It also gives me endless opportunities to recycle some of the various kinds of paper, cardboard, or dried bits and pieces of flowers, seaweed, lichen and other gifts from nature's bounty and make some wonderfully fun, and truly lovely home-crafted journal and gift card paper. I've only managed to share bits and pieces of these projects without ever creating a tutorial for those of you that have never tried this great activity, so decided to share a composite of a variety of experiences, today. 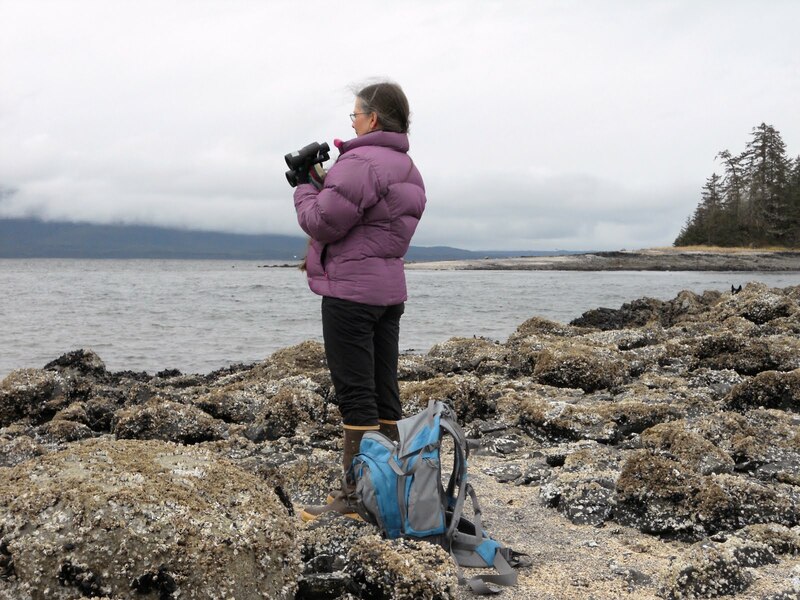 You will notice that the photos travel from three locations in Alaska to three plus locations in Oregon. All time/space occurs at once and I am in that flow, always! 1.Clean paper: (unprinted works best, print will create a grey product) I prefer leftover sections of computer paper that aren't printed on ..I save all of my print offs and cut off the blank areas. You an also use old cards, paper towels, napkins, tissue paper, construction paper, newspaper, magazine pages, paper egg cards etc. And then, there is the whole world of plant fibers...dried lily leaves, skins of onions etc. Any plant fiber that is dry or any one that has color to it that is not dry..flower and fern fronds, evergreen tree needles..you get the picture! It's wildcrafting!!! 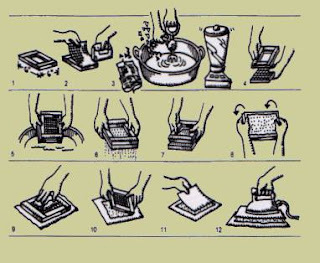 2.A blender or food processor, a big wooden spoon, a sponge and a big pile of old washcloths and/or toweling. 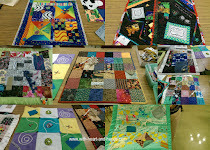 3.Cotton or flannel fabric pieces cut or ripped out to about 12" x 14". 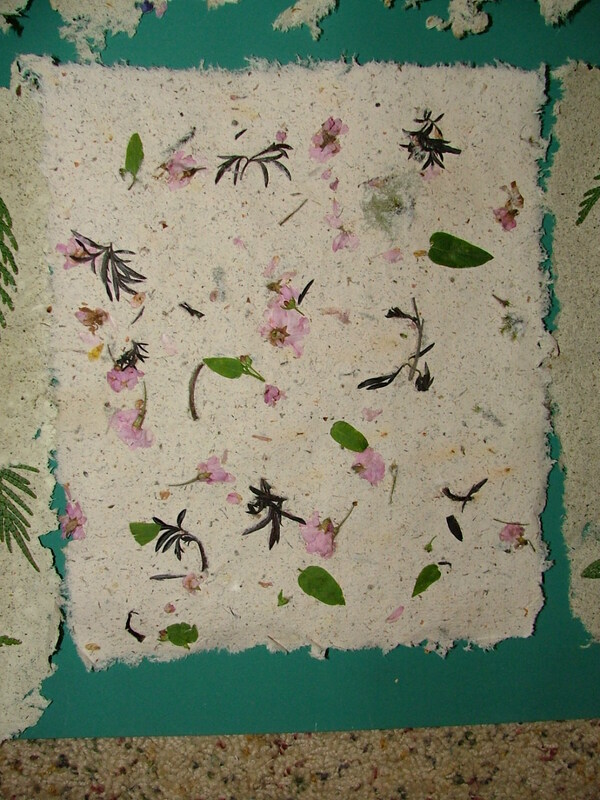 I use 14-18 for a long paper making session of work. 4.A wooden frame to be used as a deckle: such a two flat photo frames, one extra deep photo frame, or wooden strips made into frames. A one piece deep unit is called the mold. A two piece unit combines the mold with an open, non-screened unit called a deckle. 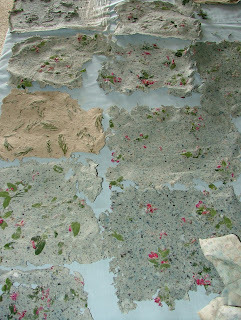 A mold used alone, creates raggedy, uneven edges..which I love! 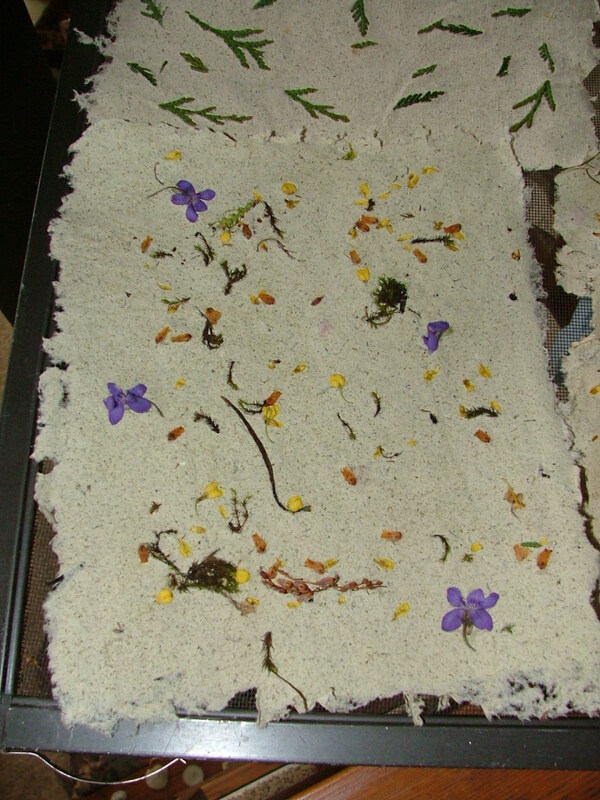 A mold added on top creates uniform , straight edged paper. So, you need at least a mold. This can be an 8"x10 picture frame that can go into water repeatedly. 5. A piece of plastic or rustproof metal window screen. It should be cut to fit your wooden frame to the very outside edge and around to the back. Fit to back, duct tape all edges to seal shut around the outside edges and staple all around. This is called your mold. Another one..no screening..if you want a deckle, as well. 6. A plastic bin or very large basin/tub with sealable lid for storage. Deep enough to swoop or scoop pulp and water over the mold. 7. 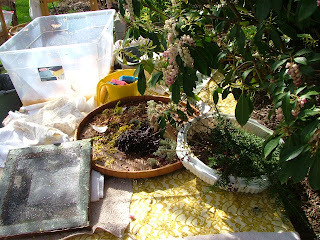 Bits of recylced paper or other plant fibers and ....optional to some, but essential in wildcrafting.... bits of organic materials like moss, leaves, flower petals, seaweed, grape skins, blueberries, whatever..it's all good....at least to try out! If you don't have large amounts of clean (non printed) paper on hand, use cheap white paper cut into little pieces. 1. Select the pieces of paper to be recycled. 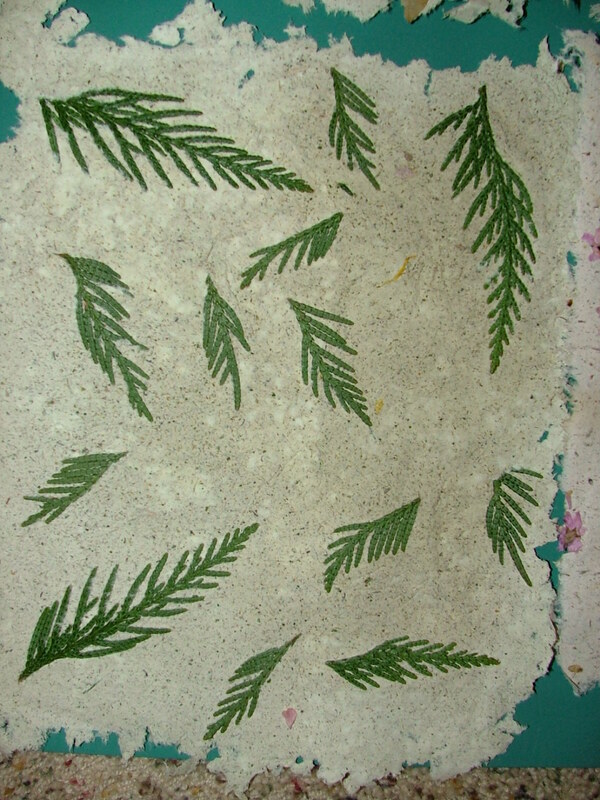 You can even mix different types to create your own unique paper but you might start out with plain, non inked. 2. Rip the paper into small bits, about 1" square, and place into the blender. Add water, and mix at a fairly high speed until it turns to pulp. Now, add more bits of paper, more water....about half full. Blend again. 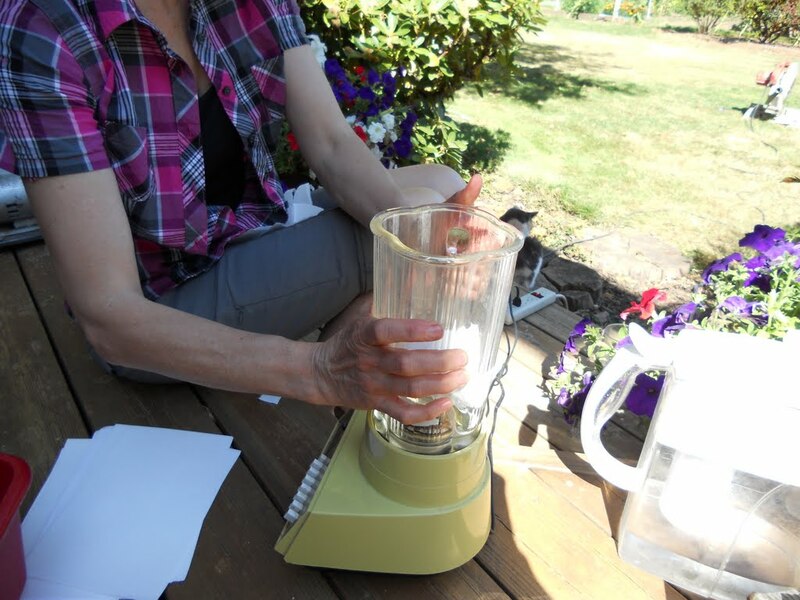 Each time, make sure the blender has warm water and paper fibers. Run the blender until the pulp looks smooth and well blended. ( 30 -40 seconds) Check that no flakes of paper remain. If there are, blend longer or decide to leave in as a special effect ;) It should feel like thin oatmeal to the touch and is 'about' four parts water to one part pulp. A lot of decorative elements adds bulk and changes the mix..more water! 3. 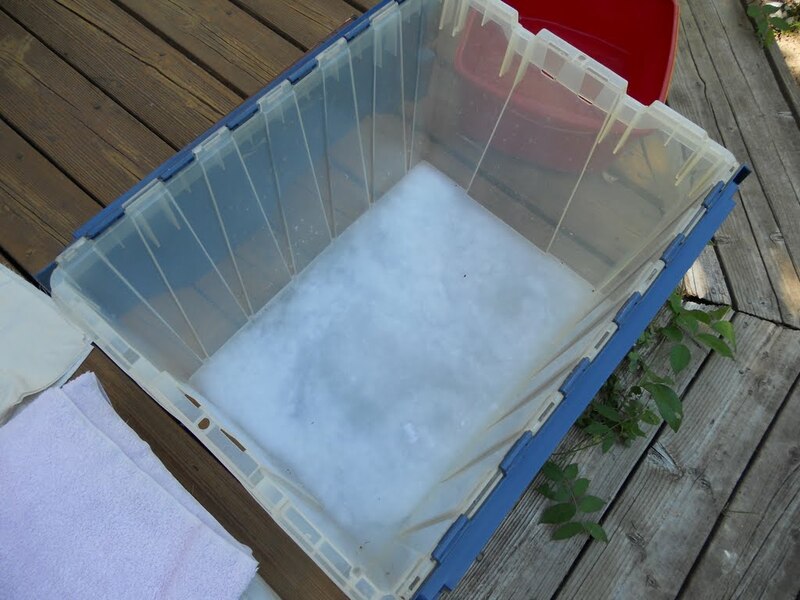 Dump the blenderful into the big plastic storage bin. Add containers of warm water until it is about 1/2 full. Your pulp should feel more watery than pulpy. But you can still feel the pulp viscosity in it. 4. You will be adding somewhere from 3 to 6 blenderfuls of the pulp per batch. 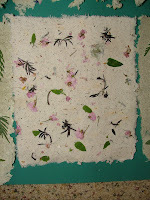 The more pulp you add the thicker the finished paper will be, Stir the mixture. 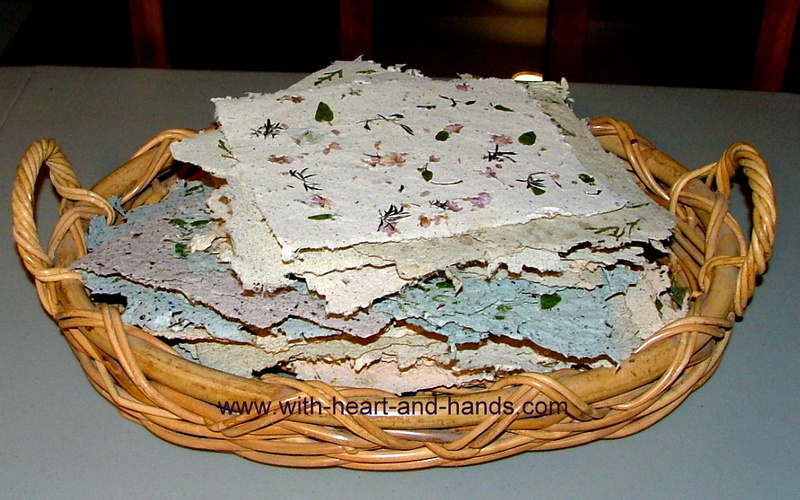 You actually want it quite thin and you should stir the mixture with your hand over and over in between creating your sheets of crafted paper. I keep adding more and more thick pulp as my bin mixture thins from use. A heavy day of work may require 10 blenderfuls. 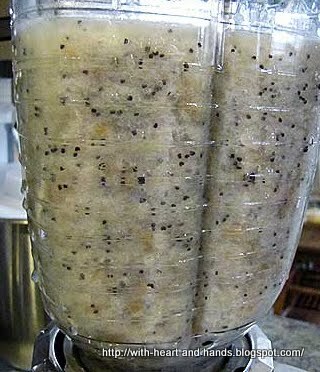 Each blender is filled 3/4 full by the end of each section of blending. 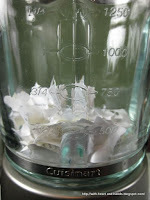 Use a fairly high setting or the motor will struggle and stir repeatedly to dislodge mash from blades. 5.Place the mold/ screen into the pulp water and then level it out while it is submerged. Gently wiggle it side-to-side until the pulp on top of the screen looks even. You can shift it until pieces float into empty areas to fill them in. 6. Slowly lift the mold up until it is above the level of the water. Wait until most of the water has drained from the new paper sheet. 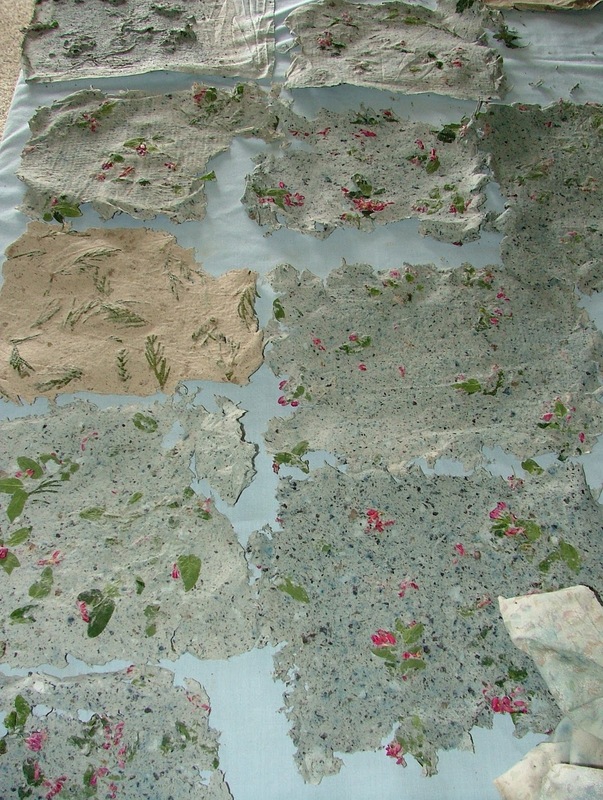 If the paper is very thick, remove some pulp from the tub. If it is too thin, add more pulp and stir the mixture again. Keep it on the thin side. * These photos show the use of a two piece framing unit. The mold can be used singly, as it has the window screening applied with duct tape and staples all the way around. The flat part..not the recessed window appearing part...is place upwards. Then the second unit..an open frame, no screening...is place on top to control the flow and placement of the mash. This contains the pulp and creates a rectangular or even piece of paper. 7. 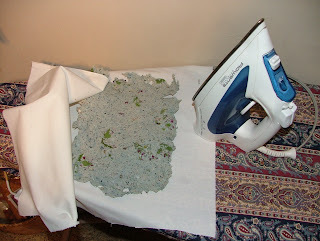 When the mold stops dripping, lift it up to a table top surface. 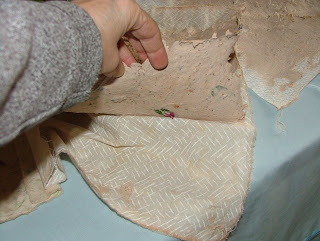 Place a square of fabric on top, and ease the mold down flat, with the paper directly on the fabric. Use a sponge to press out as much water as possible. Wring the excess water from the sponge back into the large plastic tub. If your mash is heavy on vegetation, as mine are, press excess water out over the bin and then again on toweling through the fabric laying on top. 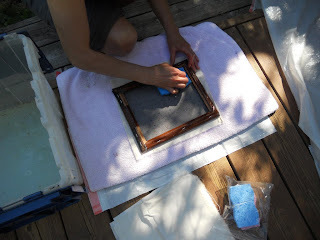 Then flip over, fabric down, and sponge rub through the screening to get the last of the water out. 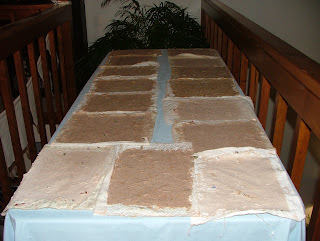 Then and only then flip it over onto its fabric backing in position for drying...the next step, down. 9. Repeat the steps above, and fill up your table top surface with all of your drying little paper/fabric rectangles. *Photos below show the use of a single screen...the mold....this creates an irregularly shaped piece of naturally crafted paper. 10. 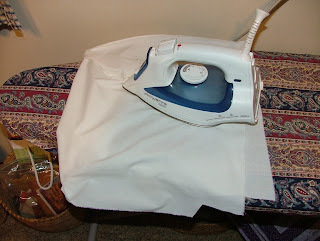 After you find they are dry and all nice and dry..they will be stiff...take one corner and gently pry/peel it back off of the fabric until the entire sheet of paper is loose from the fabric. As you peel each sheet of paper off, just stack them up in a pile. * Note: while the paper is drying on its little fabric pieces, the 'pretty' or 'right side' will be down..you won't see what it actually looked like until it has dried..about 24 hours later...and the fabric is gently peeled off.I have a bridged loft area, so I use a craft table to hold my drying paper on as it dries. No one walks there except to open or shut a window or turn on our stereo..or during Christmas to water a Christmas tree that sits where this big palm lives the rest of the year. I love my little bridge to nowhere..I use it a lot! When it is mostly dry, you can gently peel it off and lay the sheets down on a dry, clean surface before ironing. Now, the paper with all of its beautiful wild crafting is visible. 11. Later, they can be pressed with a warm iron, or pressed within heavy books to flatten them. Ironing is faster, just watch your temperature and don't scorch them! 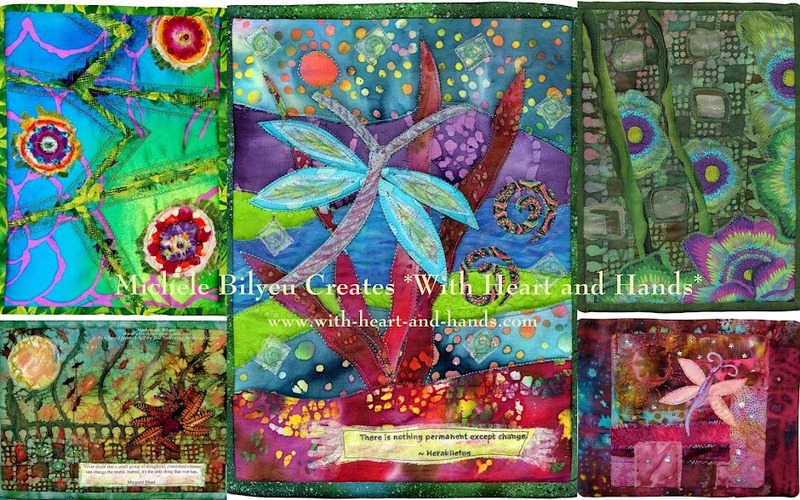 Your lovely homemade art paper can now be used for lovely craft projects or covers for notecards, invitations, journals, poetry etc. 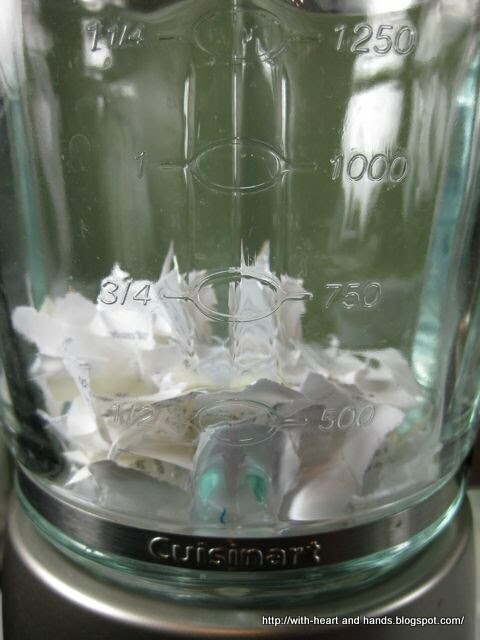 If you wan to be able to write on them, at the early stage of making the water/pulp solution, just add 2 tsp. of liquid starch. This will allow your writing ink to stay on the surface and not seep into the paper. 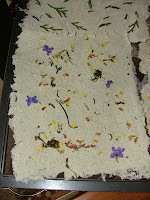 We had so many truly beautiful pieces of home crafted paper! And yes, it is a lot of work and it takes a bit of time. I dedicate half a day to each complete batch. And between two or three sessions in Alaska, and three or four sessions in Oregon...well, I loved it enough to go to that much work! And to me, it is seriously worth it! Each piece is unique and one of a kind! Such beautiful work, my son and I were talking about doing this now that the warm dry weather is here. How serendipitous of you to show us how. wow...so much information and photos..thanks for another creative post...who knows? I may even try it one day with Alice. 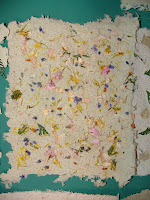 I love hand made papers! Yours look like fun!